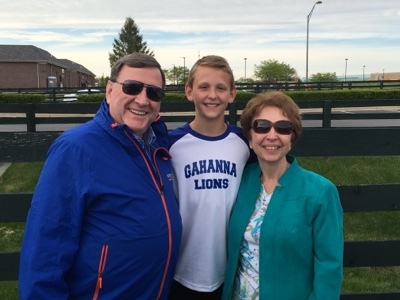 WingerBLOG: 20160516 - Jack is a Teenager! 20160516 - Up in the am and J opened his presents :-) Everyone off to school and work. L headed to her great aunt Marcelene's funeral, she said it was and good to see al the family again. I headed to the ball field in mid-afternoon to help with the state district tournament. Had to make a quick stop at home as my phone is using power faster than I can charge it... To the fields and got the concession stand set up and running. There were a lot of players there to help, including D. I left about halfway through to meet LJ, Gma&paB, and the Cole's for a bday dinner with J at Longhorn Steakhouse. J got a huge steak, ate it all and looked a bit over full :-) We watched G's game on online, they won 20-7. Home and D&J out back playing with J's new lacrosse stick. G home, told us about the game. All boys to bed. i got Doc and we went to Bible Bangers. Home and couldn't sleep.